Another amazing addition to our ultimate collection of ben 10 games is the Ben 10 Four Arms Smash! And, this time, one of the most powerful Ben 10 aliens – the Four Arms – is on a smashing spree! Use the mega powerful punches of Ben 10 Four Arms to destroy the monster maggots while you run through the lanes of the maggot breeding site! Help Ben in killing all the maggot monster as the time is limited. But before that read further about the gameplay! The planet is in danger as the maggots are turning into a deadly monster called Magg-O-net. It eats everything that comes in its way. The more maggots join together, the more powerful becomes this monster. Ben takes up the responsibility to save everyone. The only alien who can destroy these giant maggots is the Four Arms and Ben takes no time to turn into Four Arms to smash these maggot groups before they turn into the monster. Recommended: Play Ben 10 Running Games online for free now! In Ben 10 Four Arms Smash Game, your task is to guide the Four Arms across the breeding site where these maggots are multiplying themselves to turn into the monster. You have to use the arrow keys to move Four Arms left or right as he runs through the lanes. You just take the Four Arms near the maggots that fall in way and it will automatically smash them to death! Each smashed maggot adds 1 point to your score. Let me tell you, Ben 10 four arms smash is a time based game and it gets over as soon as the timer on the top left corner ends. But, you can collect clocks that come your way which adds extra seconds to your timer. Pro Tip: Whenever a clock appears on the path, just leave everything and grab the clock to get bonus time! Run as fast as you can, Smash as many maggots you can as the planet’s safety is in the hands of Ben 10 Four Arms! 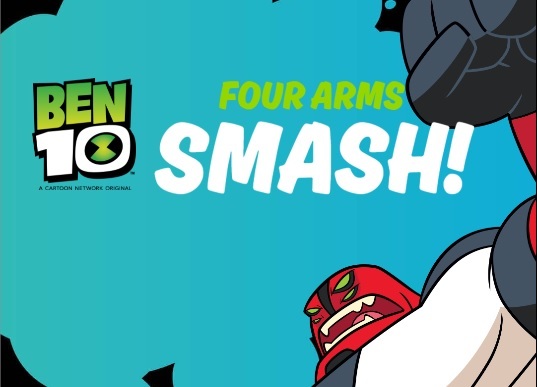 Don’t Forget to give your rating for Ben 10 Four Arms Smash game and share your tips and tricks to win this game in the comments section below.